The 1910 Williams Caramel Baseball Card Set or E103 contains 30 cards, each measuring 1 1/2" x 2 3/4". 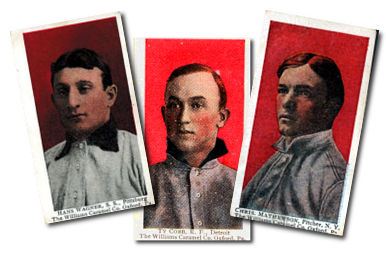 The front of the E103 cards contain player portraits with red backgrounds. A majority of these portraits are reused images from the M116 Sporting Life set. The bottom of the cards contain the phrase "The Williams Caramel Co. Oxford Pa.". The E103 cards have blank backs, and the paper stock is slightly thinner than that of what you would normally see from another caramel card issue. The 11 Hall-of-Famer players in the 1910 Williams Caramel set are: Chief Bender, Roger Bresnahan, Mordecai Brown, Frank Chance, Ty Cobb, Eddie Collins, Sam Crawford, Hughie Jennings, Nap Lajoie, Christy Mathewson and Honus Wagner. CLICK HERE if you want to sell your 1910 E103 Williams Caramel Baseball Cards.